What is an IBM and how can they help YOU? Dan Allen, Chemicals and Energy: Dan has over sixteen years in all areas of the chemical industry. He’s also a Six Sigma black belt and master black belt with a focus on LEAN and process optimization. Doug Ahrens, Life Sciences: Doug is our newest IBM, joining J.A. King in July. Prior to that, he was in the pharmaceutical industry for seventeen years. Doug has a master’s in biochemistry and cell biology and numerous scientific publications to his name. Tory Manning, Consumer Products: Tory has over nine years in industrial metrology and has an MBA in International Business. She works with customers from tobacco and firearms to appliances, electronics and cosmetics. But don’t just take our word for it! Call Dan, Doug or Tory on 800.327.7727 or email them directly ([email protected]) to see how they can help you! 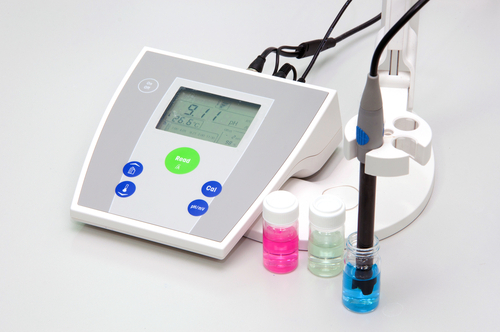 Accredited calibration for clamp-on type ammeters, used to check high current, in Greensboro and Raleigh. 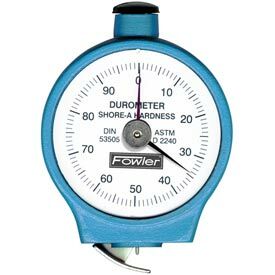 ability to calibrate magnehelic-style gages, which are used to measure differential pressure in low pressure situations. And don’t forget, if you need the calibration and it’s not accredited in your local branch, J.A. King will handle the transfer internally in a process that’s transparent, yet invisible to you, with our normal turn-around times in effect. Service manager Johnnie Boothe and his team in Greenville are very excited by their new water flow stand. It gives Greenville the ability to do NIST-traceable calibrations of water meters up to 6,000 gallons per hour with an accuracy of ±0.75%. Best of all, it’s portable, so we can calibrate on a customer’s site, if needed. 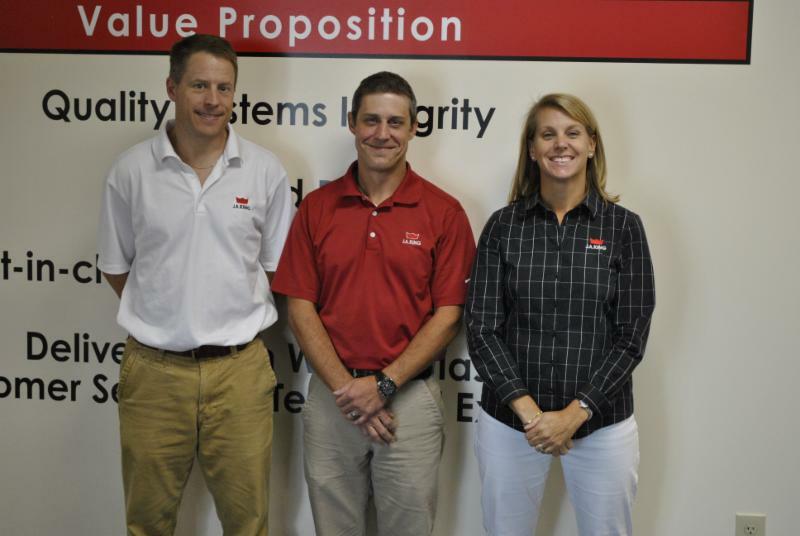 Raleigh service manager Stacey Susca and her team are now accredited for low volume gas flow calibration. 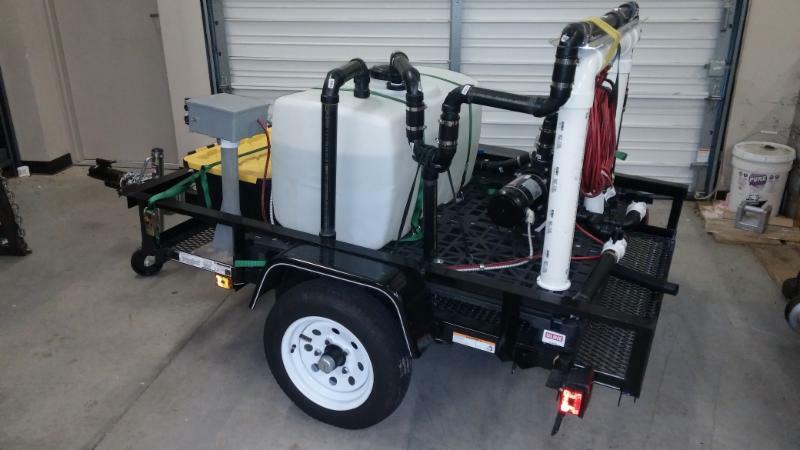 They are using a Fluke Molbloc flow calibration system, an advancedtool specifically designed for low gas flow which can handle flow from 10 sccm to 120 slm. 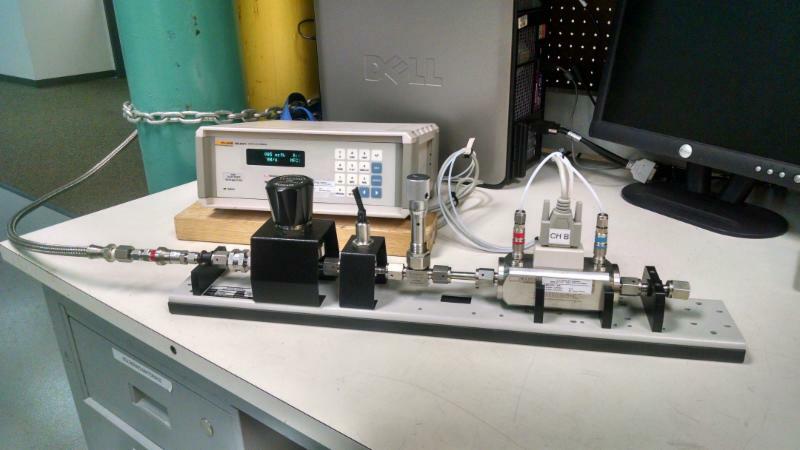 We did our first accredited calibration, for A.O. Smith’s Testing Lab in Johnson City, TN in August and we’re now open for more business. Please talk to your J.A. King account manager about calibration of your gas meters today! Waste is something to watch in any type of manufacturing environment but gathering exact data can be tricky. 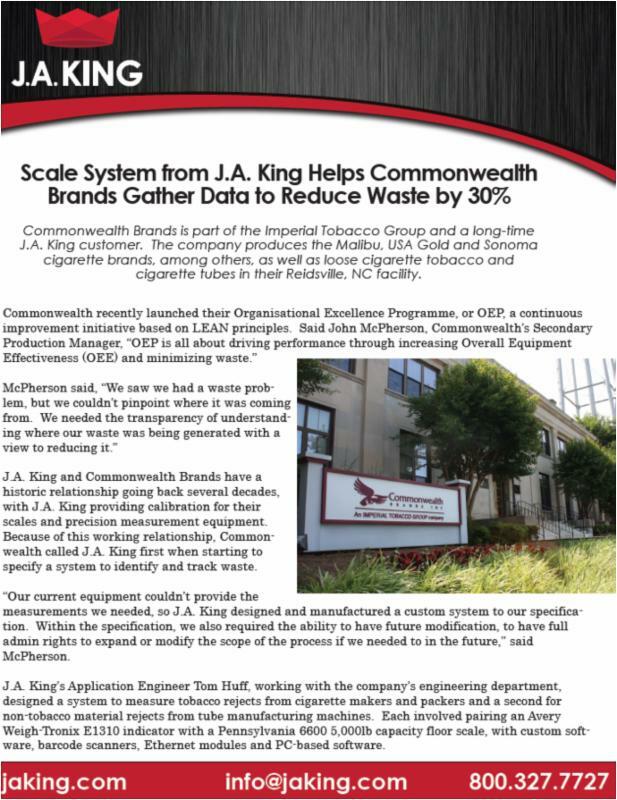 Commonwealth Brands, a large cigarette manufacturer based in Reidsville, NC, turned to J.A. King’s engineering department to help them understand where their waste was coming from. This new case study describes the scale system that our engineers designed for them and how it contributed to the success of their continuous improvement initiative.